Thanks Amo il Lino @wearelinen for a great 36 hours in Milan! How does Domenico keep getting better looking? My old personal nickname for him was IL GATTO (the cat) but now with his white linen suit and white hair he’s The White Knight!! Tremendously stylish…when I wear a white suit…splat,a new stain is born! love the all white look! suits him well! So cool always. I really love Domenico’s style, especially his black eye glass. Love this total white look! So cool always, I really love Domenico’s style & taste, especially about black flame eyeglass. Our man in Havana, in pristine white linen and a cigar! So brave. 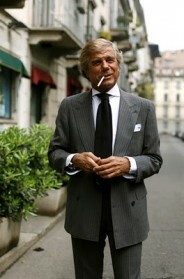 White suiting and cigar. That dude can pull off anything. One of the (many) benefits of being really good-looking. Even so, this is a very cool look. The weather must be a lot better there than it is in NY. The man with the short legs? It is obviously Italy, what else, spectacular! He’s like a birch in Autumn. If the color of the leaves changes the whole tree will change its color. These hair of him are his leaves. White Knight is right! 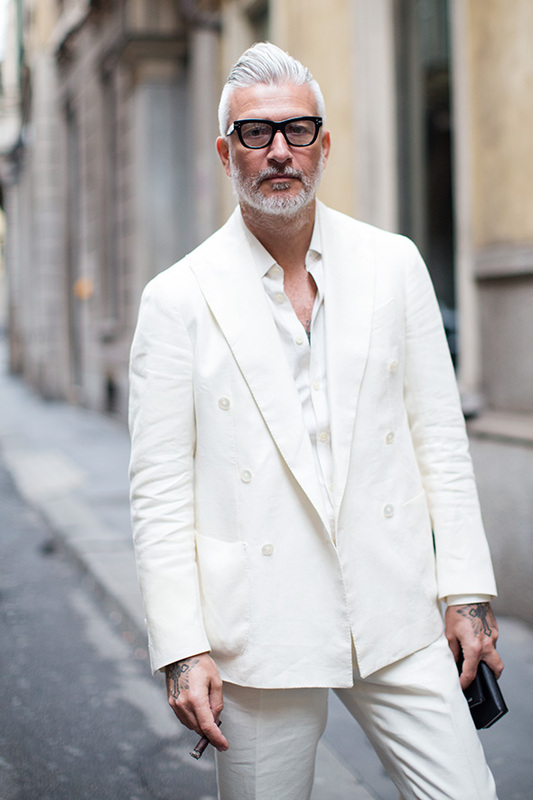 Honestly, it seems as though Italian men all age so gracefully….something to aspire to for sure.